The Concept i-Ride, far left, and Concept i-Walk flesh out a Concept-i series of vehicles introduced with the original four-seat Concept-i car, right, at the CES in January. 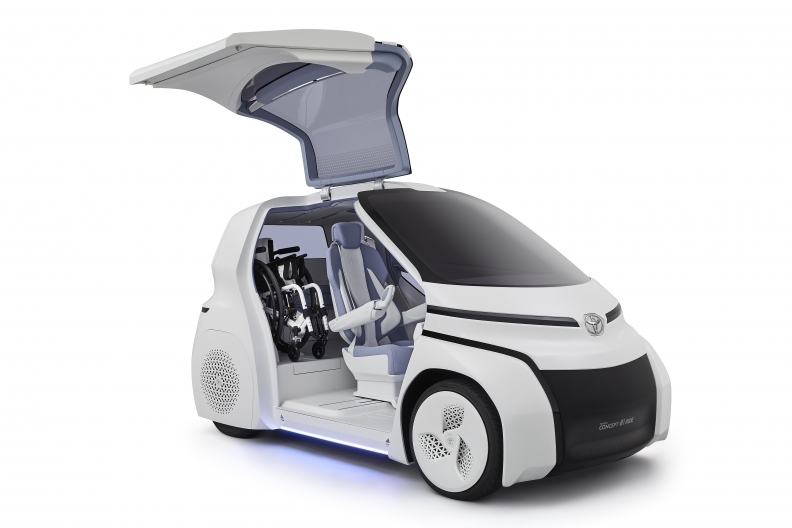 TOKYO -- Toyota plans to broaden its vision of future mobility at the Tokyo auto show with two tiny electric runabouts that predict the driver's emotions and guide them away from danger. The Concept i-Ride and Concept i-Walk flesh out a Concept-i series of vehicles introduced with the original four-seat Concept-i car at the CES show in January. The Concept i-Ride is a two-seat pod car perfect for crowded city streets and envisioned as a personal mobility option for the elderly or handicapped. Its gull-wing doors open wide to allow easy loading and unloading of wheelchairs, and it is driven by a joystick, instead of pedals. The Concept i-Walk is a three-wheel Segway-like scooter on which the driver stands. Toyota envisions the trike as a way to zip around pedestrian zones or tourist sights. 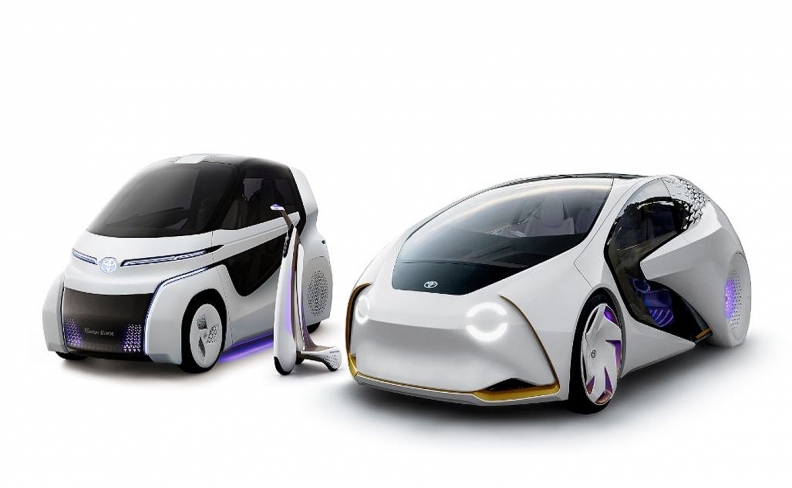 Both concepts, previewed Monday as part of Toyota's Tokyo auto show plans, are battery-powered and positioned as having ride-sharing potential. The Concept-i Ride would have a range of between 62-93 miles, while the Concept i-Walk is seen as cruising up to 12.4 miles on a full charge. The series name is a play on the Japanese word for love, which is pronounced like the letter i. It reflects Toyota's desire to position intelligent cars of tomorrow as beloved partners with an emotional connection to the driver, rather than as just utilitarian appliances. Toyota said it will start road-testing some of the Concept-i autonomous driving and artificial intelligence technologies in the home market around 2020. The common thread is an artificial intelligence system that taps deep learning to absorb the driver's habits and behavior, make predictions and suggestions and protect the occupants. For example, by monitoring the driver's eye movements, facial expressions and gestures, the cars aim to predict if the driver is becoming sleepy or irritated. Current systems can recognize fatigue or anger after the fact, but Toyota says that's too late. It wants a system that can predict the driver's state of mind ahead of time. For example, if the driver is becoming annoyed by heavy traffic and beginning to huff, the computer might respond by inflating and deflating the seat at a slow rhythmic pace. That could slow the driver's breathing, helping to take the edge off. Or when drivers are getting sleepy, the car will step in to keep them awake before the start to doze. Toyota showed another video in which the talking artificial intelligence program sensed the driver becoming depressed. The computer then dipped into its digital music memory banks to pull up one of the driver's favorite old songs in an effort to cheer him up. "The Toyota Concept-i series," Toyota said in a statement, "aims to become a 'beloved car' of a new era guided by the concept of 'more than a machine, a partner' to better understand the driver and grow together with the driver as an irreplaceable partner."